If you are intending to eat regularly in College, you can opt to pay the Kitchen Fixed Charge the set contribution towards kitchen overheads - details will have been sent to you (but ask in the College Office if you have any queries) - which allows you to eat in the Buttery and the dining Hall at a discounted price each time. The College card can be used for purchasing food in the Buttery. Whilst this is a lot more convenient, it is not strictly necessary as you can pay in cash (it is easiest if you bring change to pay for your food). Each Friday night in Full Term, graduates have the privilege of taking a served, three-course meal in Hall, complete with wine and coffee. The meal is preceded by sherry in the MCR (or occasionally in the Senior Common Room, along with the Fellows). Each graduate is entitled to bring one free guest from outside College. Over time, Friday Hall has become a chance for graduates - who live and work all over the City - to come together as a community. Following the meal, most graduates cross Old Court for drinks and music in the MCR, where the bar remains open until 11.30pm. 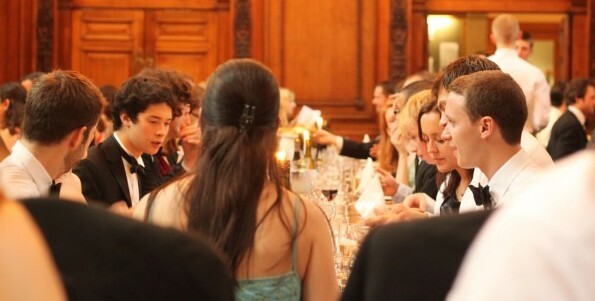 Many Halls throughout the year have a theme (including French, Russian and Halloween events) and others are intended for special events, including the Research Supervisors' Dinner and the annual Charity Banquet. Formal Hall booking is accomplished through a Macintosh in the MCR Computer Room; generally, booking opens on Monday morning and closes Thursday afternoon, although space sometimes fills up earlier. Graduates may book a single double ticket between Monday and Wednesday, but may book additional guest tickets on Thursday should there be space remaining. Spouses, partners, and all guests are warmly welcomed. In addition to the College Bar adjacent to the JCR, there is also an MCR bar, which is run by the MCR Committee. The MCR Committee is responsible to the Licence-Holder for all aspects of the MCR Bar's management. Clare students who bring guests to either the MCR or College Bars are responsible for their guests' behaviour.